PLM at risk–it does not have a single, clear job ! Last year, I read Clayton Christensen’s book “The Innovator’s dilemma – When New Technologies Cause Great Firms to Fail “. I was intrigued how his theory also applies to PLM and wrote about it in a blog posts last year. 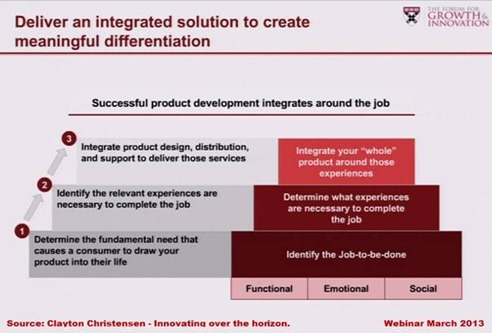 Recently, I attended an HBR Webinar “Innovating over the Horizon: How to Survive Disruption and Thrive” , which raises serious implications for PLM. As presented by Clayton Christensen and Max Wessel, both professors in the Harvard Business School, I foresaw numerous consequences demanding attention. The above diagram explains it all. Often products come into the market with a performance below customer expectations. The product will improve in time, and at a certain moment it will reach that expectation level. Through sustaining innovation, the company keeps improving their product(s) to attract more customers, and start delivering more than a single customer is asking for. This is for sure the case in PLM. All the PLM vendors are now able to deliver a lot of functionality around global collaboration, covering the whole product lifecycle. Companies that implement PLM, just implement a fraction of these capabilities and still have additional demands. 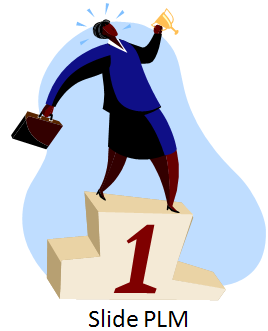 Still the known PLM vendors nearly always win when a company is searching for a new PLM solution. Disruption comes from other technologies and products. In the beginning, they are not even considered by companies in that product space as a possible solution. As these products improve in time at a certain moment, they reach that level of functionality and performance, a potential customer can use these products to address their demands. At this stage, the disrupters will nearly always win the battle. The reason is that they are more close to what the customer wants than the incumbents. Their product performance and price point are most likely to be more attractive than the incumbents´ portfolio. As a PLM consultant, I need to provide some second thoughts to keep my job. There is much more behind Prof. Christensen’s theory, and I recommend before agreeing with what I write, read his books ! And although there is a horizontal time axis where the disruptive technology comes in, it does not indicate it will be this year or next year. If you are aware that disruption can kill your business, how likely is it that it will happen in your business and when? If your company’s value is on delivering products, instead of delivering means to get the job done for your customer, you are extremely vulnerable for disruption. As companies are looking to get their job done in the most efficient manner, they will switch at any time to new solutions that provide a better way to get the job done, often with a better performance and at a lower price point. I realized that this is one of the big differences between PLM and ERP. Why is there such a discussion around the need for PLM and I do not catch the same messages from the ERP domain ? Maybe because I am a PLM consultant? ERP has a clear mission: “To get the job done – deliver a product as efficient and fast as possible to the customer”. ERP is an execution system. Although ERP vendors as well are delivering more than their individual customers ask for, the job is more clear defined. For PLM, it becomes fuzzy. What is the job that PLM does ? Here, we get a lot of different answers. Have a look at these definitions from some vendors. For companies of any size, Autodesk PLM 360 helps to streamline your business processes for more efficient product development, improved profitability, and higher product quality. I also reviewed the websites from the other PLM vendors, and I can confirm: None of them is talking in a clear way which job needs to be done. All PLM solutions are around technology and products. My interpretation is that PLM has not even reached level 1. Still many companies are struggling to understand the fundamental need(s) for PLM. Interesting to see is that Dassault Systemes in their messaging and approach is already targeting level 2 – the experiences. If potential customers will embrace the experience approach without passing level 1, is something to observe. 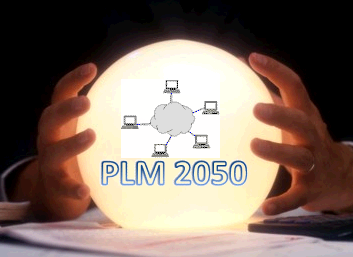 In my December 2008 blog post “PLM in 2050” and recently in The Innovator’s dilemma and PLM, I wrote that I believe PLM as it is currently defined, will disappear. Perhaps made redundant by a collection of disruptive technologies. Main reason is that PLM does not do a single, clear job. One of these disruptive candidates to my opinion is Kenesto. They deliver “social business enterprise software to empower teams” as stated on their website. Kenesto is not considered as a competitor of classic PLM, starting on a different trajectory. For sure there will be more disruptive candidates aiming at different pieces of the PLM scope. Does PLM have too many jobs ? Will PLM survive disruption ? I believe PLM vendors are very focused on supporting customers that deliver products, instead of delivering means to get the job done for their customers. Therefore the PLM vendors are vulnerable since their customers are vulnerable to disruption. The whole PLM business is more or less focused on supporting the development of of products instead of enabling the creation of their customers customer value. The PLM vendor able to help their customers in getting the job done for their customers will be the most successful. In this case I do not believe it is about an experience for the PLM customer it is about enabling business transformation and achieving customers business result. It may seem unclear or fuzzy and I therefore believe that the PLM acronym will more or less disappear. The value assessments we have seen from PLM vendors I strongly believe will have to change from a process focus to a customer transformation focus. Pelle thanks for illustrating all jobs PLM can do – Have a look at Henk Jan Pels´s comments – would the CFO invest in one of them ? It is a great issue your touch here. PLM is already 25 years a product and it still has the acceptation problem you mention. The comparison with ERP is interesting: it started round 1970 as MRP. The breakthrough came after 20 years, with the integration of production planning and the financial system. Then ERP became the toy of the CFO: it did his job to keep control over the flow of value (money, material, resources) in the company. That is why ROI studies are not required for ERP: bookkeeping is necessary, whatever it may cost! A strong example of disruptive innovation was the relational database. The idea of the relational model was published in 1969 and the relational database (driven by Oracle) was industry standard by 1985: only 15 years! 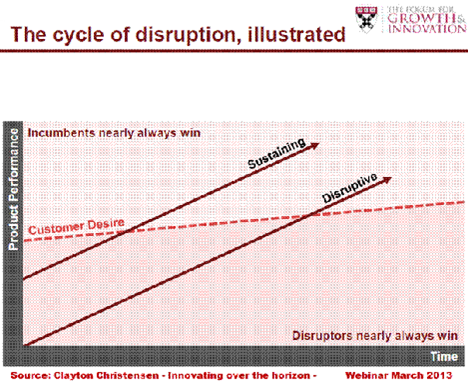 Note that disruption is not easy. The object oriented database, although functionally stronger, never made it, because it could not compete with the huge investment in performance, already made for the relational database. I am not afraid for disruption of PLM. The name may change, but the basic function to enhance product development performance in order to make product better meet the customer needs, has to be fulfilled as long as industry keeps innovating. The problem is that CFOs, who have to pay for PLM, do not regard product development as a job to be done. They just maintain a lab with wizzkids as a black box, from which innovations pop up at a certain pace. If the market needs more innovation, you only have to put more pressure. The PLM job is to enable the product development process, but wizzkids do hardly see the process. 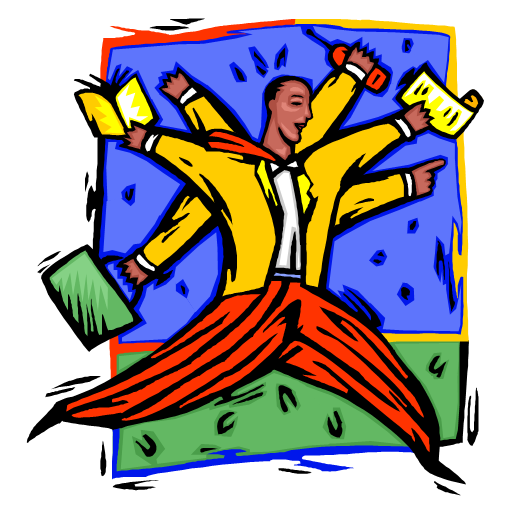 The CFO does not see the process at all, so he cannot understand that PLM will do any job. Another problem is that PLM software does not offer a nice experience, so wizzkids won’t ask for it. What we need is a few Harvard Business Review papers that report on striking successes of companies that developed a clear PLM strategy with a focus on their product development process, I hope this will happen within the next 5 years. Henk Jan, thank for your interesting insights and how you make the link with the CFO. I am a little skeptical about HBR papers as everyone finds his/her own truth. I believe there is a strong influence coming from the side of accountants, who usually focus more on financial parameters and push their customers to their ERP (read SAP) practices. I see PLM as a Concept rather than a Software Tool. PLM vendors build the features based on the need of a particular industry. Any CEOs interest is to build more products with the existing resources . I think PLM will give a hand in achieving that but as you rightly said PLM will not be successful if it is not practice unlike Bigbang SAP implementation.